July 1, 1998: the most hilarious bumper of all time is born. Take in the homologation special Mercedes CLK-LM, with the most canny, tacked-on bumper to ever grace a road car. There are lots of dumb, ugly, bad, foolish, jutting, funny bumpers to be stuck onto cars that were never quite intended to have them in the first place. Most of them were on European cars from the 1970s stuck on to meet stricter American 5 MPH bumper regulations. The Maserati Khamsin’s hideous rear bumper that displaced its exquisite taillights-in-glass sticks out in my mind. As does the much later McLaren F1's bubble front, meant to be legal in America. Hey Jay Leno, Great News, There&apos;s A McLaren F1 Ameritech Kit For Sale! And even the current Bugatti Chiron gets some weird plastic protrusions to be federal-compliant. But none of them look quite as silly as this one on the Mercedes CLK-LM. Running (and winning) the GT1 class of the 1998 racing season, the V8-powered CLK-LM was the successor to 1997's title-taking V12-powered CLK-GTR. That was the car that built on what Porsche started with the 911 GT1. That is, these were cars that destroyed the spirit of GT1 racing. The class was supposed to be for road cars converted into race cars; these Porsches and Mercs were designed as race cars first, then a handful of technically road-legal versions were produced to homologate them for their class. Guns to a knife fight, that sort of thing. The key element here is that these cars were designed as bespoke race cars first, then made into homologation specials afterwards. Cars like the McLaren F1 look gorgeous and smooth in road-legal spec, because they were designed as road cars first. This CLK-LM looks like it is ready to feast on a whale carcass at the bottom of the ocean. It looks like a Hapsburg. It looks amazingly, brazenly bad. But it was legal, and it was the easiest way for Mercedes to make as fast a car as possible to beat its rival McLarens and Porsches, so it’s what Mercedes did. It submitted these homologation documents to the FIA on July 1, 1998 with pride, noting that the front overhang alone was 3.7 feet long, in a car stretching 16 feet in total. Naturally, Mercedes ditched this bumper when it went racing. 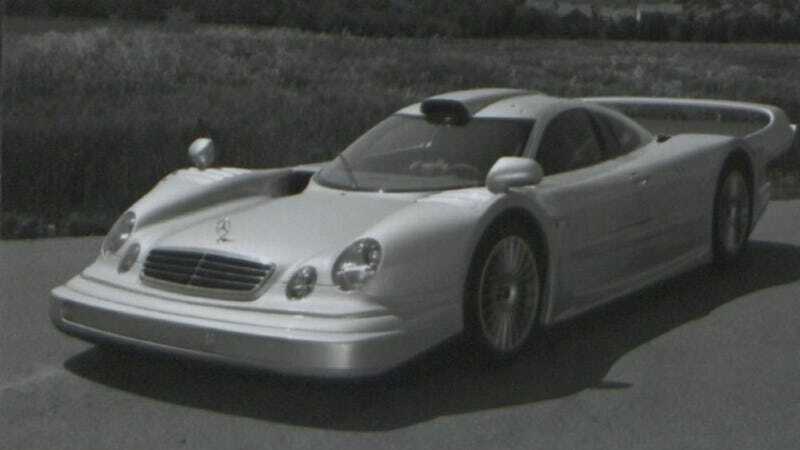 The final road car version of the CLK-LM never got exactly this front bumper treatment, instead getting something that looked a bit more like a showroom-stock CLK. That makes sense. The reset of this car submitted to the FIA for GT1 homologation was a little rough elsewhere as well, with an interior that looks more than slightly cobbled together. Still, I love it dearly. It was a rude car, and a bit crude, but sneaky and lovely and wonderful.